Lack and time and space are two common reasons for not exercising, but Excy has completely eliminated both as obstacles. 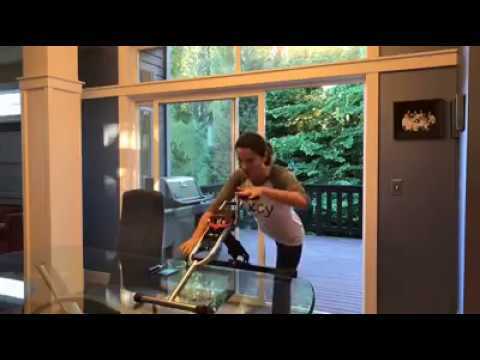 In today’s workout, we mix things up a little with a quick circuit using Excy as an upper body ergometer at the kitchen table. With throw in some squats, jumping jacks, side skates, calf raises and more while also pedaling our arms with resistance. This is a great way to get an awesome HIIT upper body cardio and strength training workout at home or anywhere else your schedule takes you. Can even do this one during homework time! Crank up the resistance to find your zone to double-dip on cardio and strength training! We love HIIT and your body will thank you as you continue to burn calories well beyond the workout. Most of all…have fun! This wraps up our kitchen table workout series! Explore more live training at www.excy.live. Download the Excy Mobile Coaching application for more HIIT ideas!.